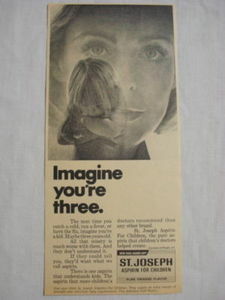 4 3/4"x10 1/2" trimmed original black and white ad from 1969 for "St. Joseph Aspirin For Children ". 1889 Ad U.S. Compound Oxygen Co., Springfield, Mass. 1870 Ad Turner's Universal Neuralgia Pill, Boston Mass.